1st Saturday: Rainbow trek to Palcoyo: above 4000 meters. 2nd Saturday: Rafting on the river in the holy valley. 45 nights accommodation in the apartment of the school in Cusco on the basis of a single room during Spanish classes and volunteer work. Or a two-person room if you travel together. After the three weeks of classes you take a tour to Machu Picchu which is called the Inca Jungle trail (description below). Upon return from the trek on Tuesday you will have one full day to relax. On Thursday you start volunteering, but Wednesday you can, if you want, already take a look at the volunteer program. You will start volunteering on Thursday in the wonderful project called Corazón de los Apus. Take a look at their Facebook page then you get an idea. You work in the afternoons from 15.00 to 18.30. 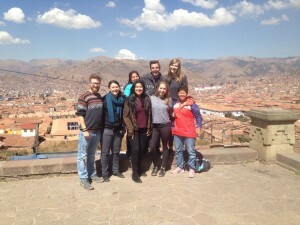 The project is located in the outskirts of Cusco.Accommodation during your classes and during the volunteering is in the school´s apartment in a single room. You leave with a taxi bus from your accommodation to San Luis in the Holy Valley (9600 ft.). Once there, after a short instruction, you will mount your mountain bike. Helmet and gloves are provided. After about 3 hours there will be a well earned picnic break in Alfamayo. After the break you’ll ride for a short time up- and downhill to Huamanmarca. Here you will find a recently discovered Inca site where you receive a brief guidance. During the 3rd part of the trip the scenery changes from mountainous to jungle. You go rafting, an experience! Once in Santa Maria, you still have plenty of time to explore the village. After a typical Peruvian dish you stay at a family-run hostal in Santa Maria. All accommodation during the Inca Trail is simple and based on a shared room. Hike from Santa Maria to Santa Teresa. After an early start you walk along cocoa plantations to a restaurant. Here you can relax in a hammock and listen to the noises monkeys make. After this break you walk to Qellomayo where it will be time for lunch. After lunch you`ll reach the traditional Inca Trail. You walk on the shores of Rio Vilcanota till you reach the famous hot springs of Colcamayo. A fantastic place to chill and relax your muscles in the hot springs. After this relaxing stop you`ll walk to Santa Teresa where you spend the night in a hostel. After two exciting and physical tough days the 3rd day will be a bit more relaxed. You start a bit later in the morning. But before you go on with the Inca trail you will go zip lining! Mid-morning the group leaves on foot to Colpani. Here you have an amazing view and after lunch you walk two and a half hours over a flat path to Aguas Calientes. Here is your hostel where you will have a private room with own bathroom. 4th day (Tuesday) last day of your Inca Trail: the Machu Picchu! After an early breakfast, you walk up to the entrance of the Machu Picchu, the lost city of the Inca’s. Here you’ll have a 2 hour guided tour. After the tour, you can wander around yourself in, on and between the archeological findings. You walk down back to Aguas Calientes where you can take a late lunch or warm up your mistreated muscles in the local hot springs (Aguas Calientes means ‘hot waters’) (not inclusive). Later in the afternoon, you travel back by train to Ollantaytambo where buses await tourists to take them back to Cusco. End of Inca Trail. 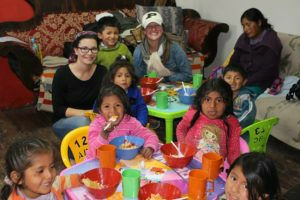 When can you start Spanish classes and volunteer in Peru? The trip can start every Sunday of the year. Only be aware when you start in november that the volunteer project is closed between X-Mas and New Years Eve. You will meet many other students and travelers at the school, during the excursions, on the Incatrail and during the volunteer work. The price of this total package Spanish classes and volunteer in Peru with 3 weeks of classes, all accommodation (in total 45 nights), 2 day excursions in and around Cusco, the Jungle Inca trail to the Machu Picchu and 17 days of volunteering is $1395. 3 weeks Spanish classes in a small group, 4 class hours per day including class material. 45 nights of accommodation in the apartment of the school in Cusco based on a single room (or a double room when you travel together with friend). Accommodation runs from Sunday before the classes until Saturday after the volunteer work. 2 excursions of one day on the Saturdays during the class period. Jungle Inca trail to the Machu Picchu. Start on Saturday after your last class. Learn Spanish in a Spanish & Adventure trip. We do not only offer classes to learn Spanish in Spanish & Adventure trips but in many other countries in Central- and South America. Go back to the Homepage to see the different possibilities of learning Spanish in Central- and South America or combining your Spanish course with free volunteer work.